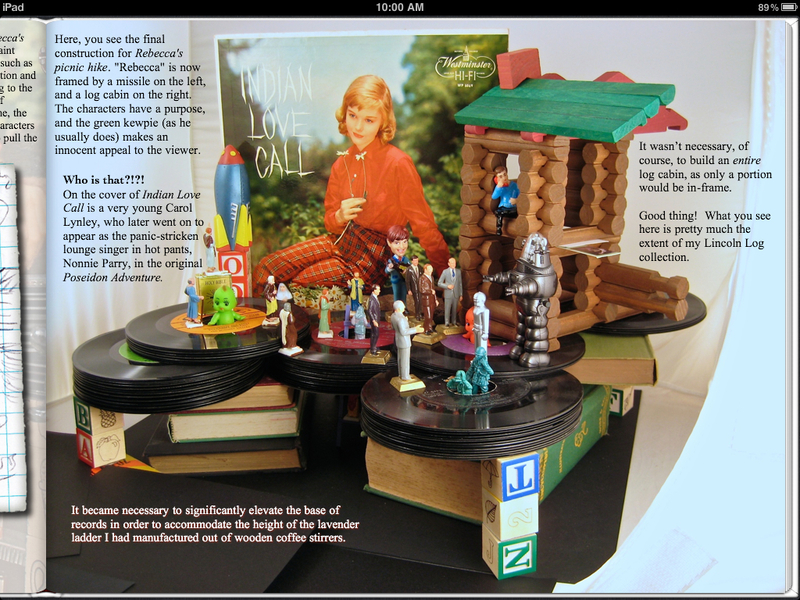 Plastic Prophets of Vinyl Redemption — Deluxe Edition released!! 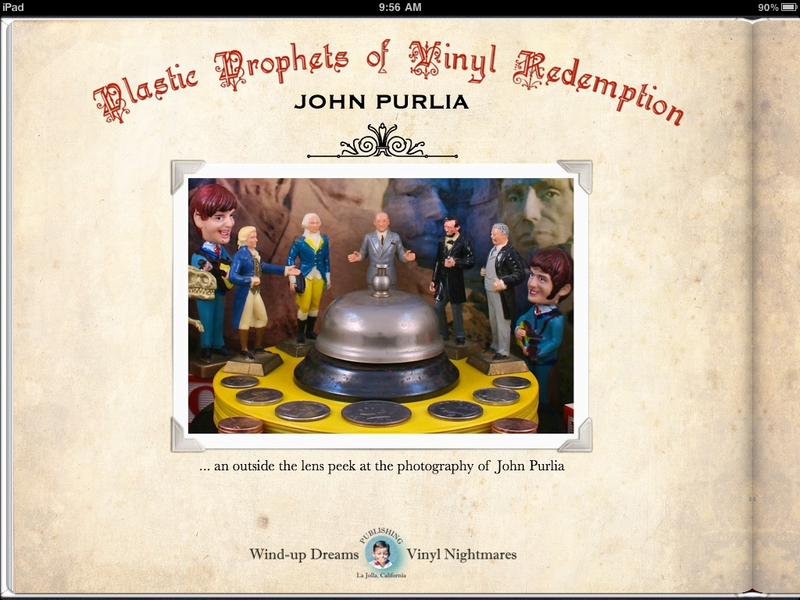 I’ve posted from time to time about the digital coffee table book of my photograph, Plastic Prophets of Vinyl Redemption, which was released this past summer, exclusively for Apple’s family of iOS devices. Creating the book was tons of fun, and I’ve been very pleased with the reception the book has received from the ebook community. 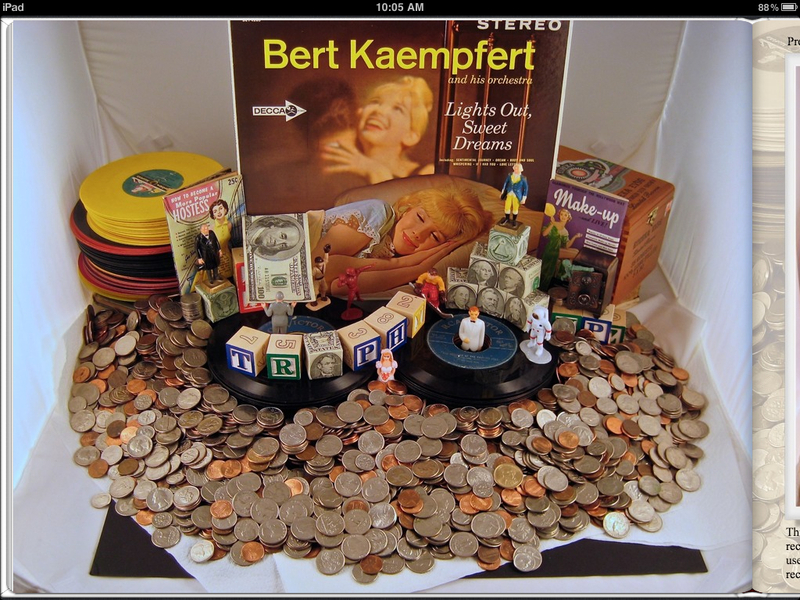 Being a collector of books (and toys, and records, and art, and CDs, and devils, and, and, and…) I remain completely enamored of objects I can touch and relate to in ways that will never be matched by the bits and bytes trapped within a digital device. What can I say? 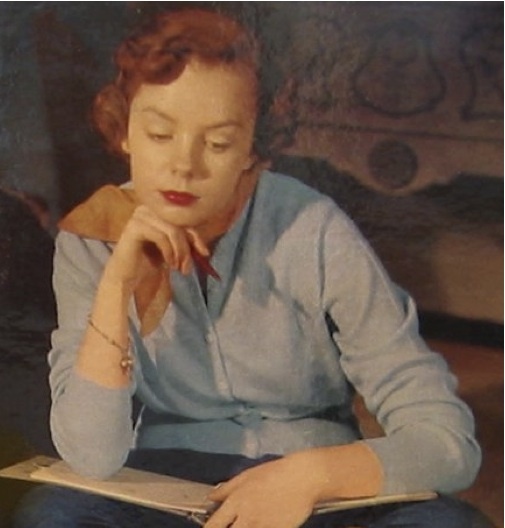 I like the feel of a book in my hands, and there are great untold mysteries in slipping a sleeve from a big, beautiful album cover and reading the liner notes as black vinyl spins beneath the soft touch of a diamond stylus. Real books feel special. They smell like knowledge. While I’m very proud of my digital book, and I’ve been quite excited to see how people have enjoyed flipping and zooming through the colorful pages on the iPad, I still wanted to produce a physical object that people could turn in their hands, explore, and connect with in ways that are difficult to mimic in a digital book. Over the past couple of months I’ve been hard at work creating a deluxe edition of Plastic Prophets, and I’m very excited to announce that the package is now available!! Deluxe Edition box with cover photo printed on glass! The Deluxe Edition comes packaged in the box you see on the right. Each wooden box is hand painted, signed and numbered, with a cover image that’s been printed on beveled glass and mounted to the lid. 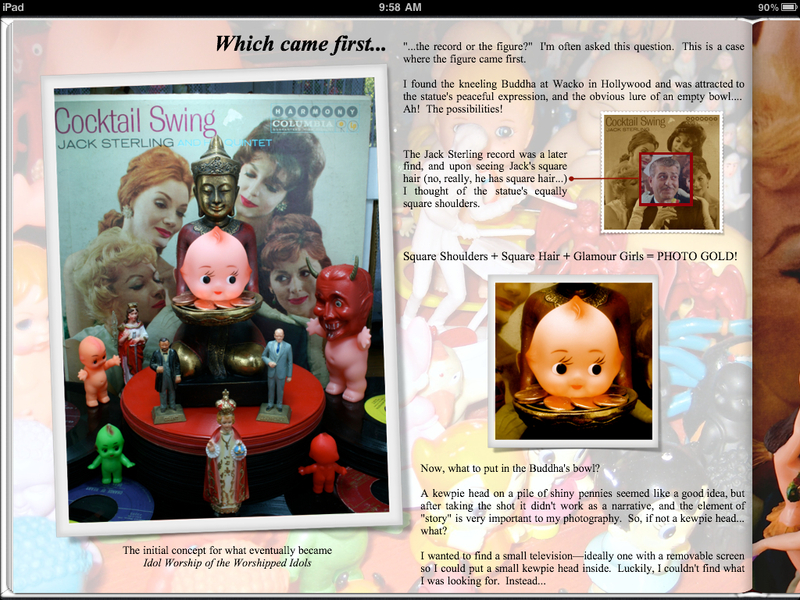 Inside are all kinds of collectable treasures you couldn’t possibly replicate in a purely digital release. The highlight is a 32 page full color “mini book” featuring many of the standout images from the digital book—here, reconfigured to be printed and bound in a limited softcover edition. Hidden away in the box are other printed goodies, including a Plastic Prophets sticker, a Wind-up Dreams web card (randomly selected from a dozen different designs), and a signed, miniature, Certificate of Authentication. Your new best friend inside the luxurious Deluxe Edition box! 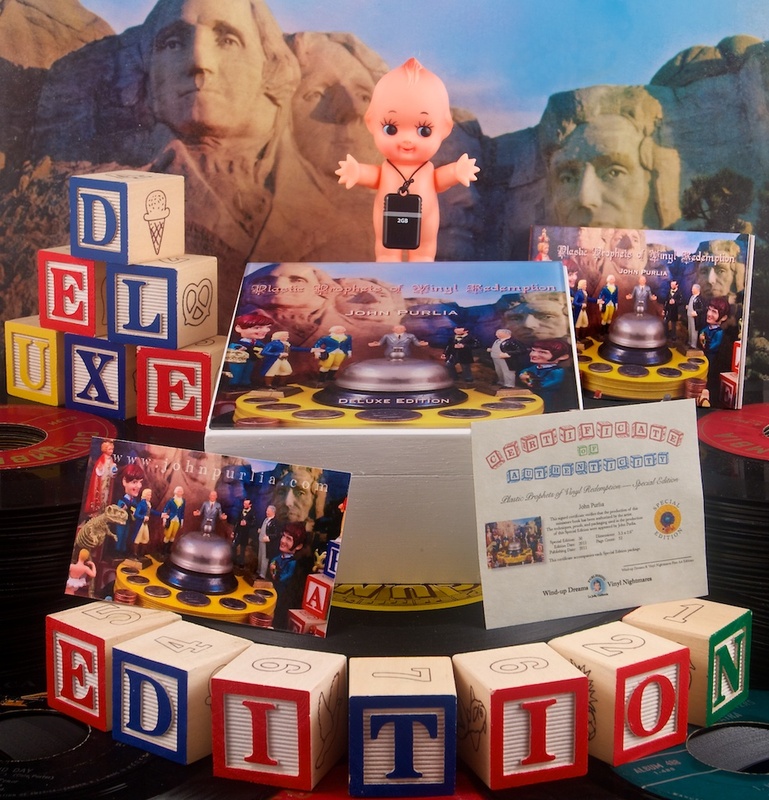 Lift the glass cover and inside the deluxe box you’ll find your very own kewpie doll, just like those you see in my photos! 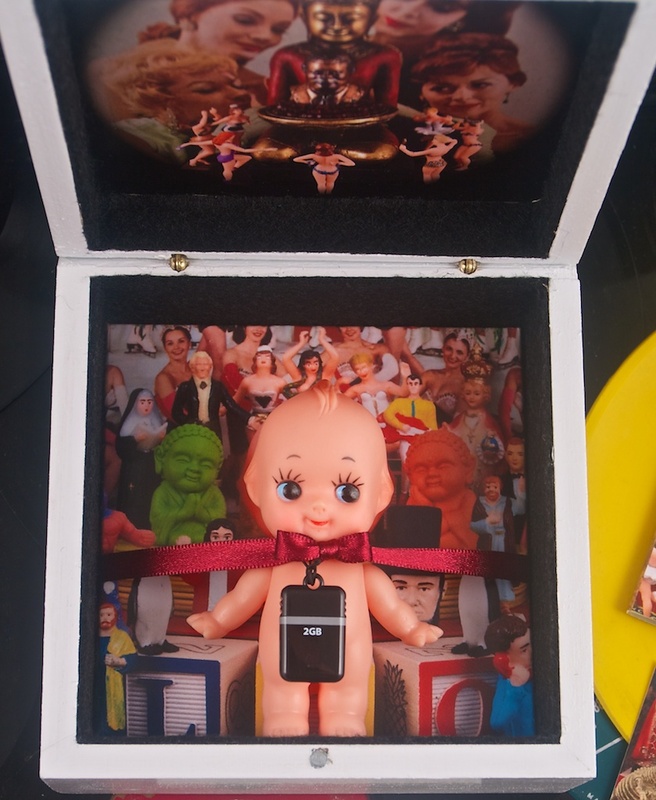 Your kewpie comes direct from Japan, and wears around its neck a miniature flash drive filled with a host of exclusive digital content. The drive holds two digital versions of Plastic Prophets of Vinyl Redemption. The first is exactly the same as the digital ebook available on Apple’s iBookstore and compatible with the iPad, iPhone and iPod Touch. And just in case you don’t have access to one of those devices, the flash drive includes the full 135 page book as a PDF that can be viewed on any personal computer. iPad users will find another added bonus on the flash drive: 95 custom wallpaper images pulled from the pages of the book to give your iPad a custom Wind-up Dreams look that will be the envy of all your friends! 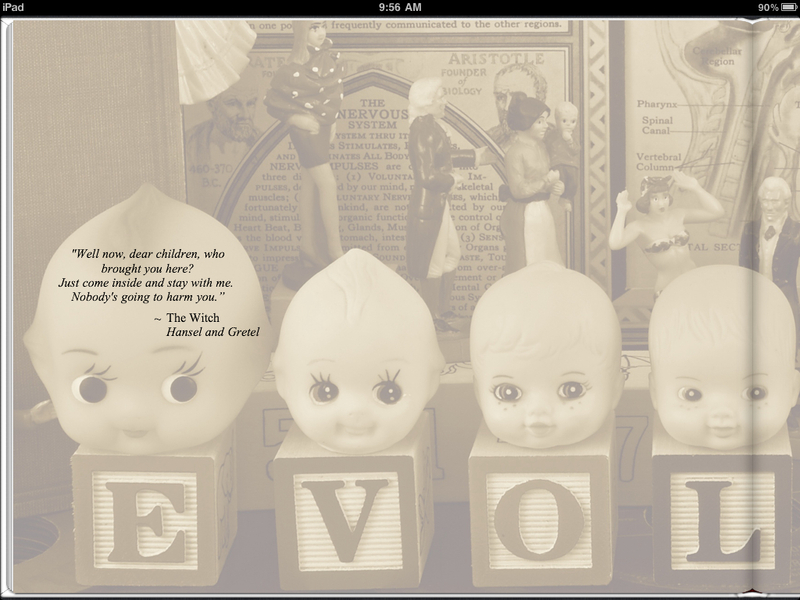 Kewpies, bathing beauties, robots and presidents. They’re all on the flash drive to brighten your electronic day. So what are you waiting for? Click on over to the Wind-up Dreams & Vinyl Nightmares Etsy shop for more information! Plastic Prophets of Vinyl Redemption – live in the iTunes Bookstore! Who of my countless readers believe in coincidence? Well, then, wouldn’t you know, on the same day that Borders announces the closing of their remaining retail stores and the laying off of thousands of brick’n’mortar booksellers… my eBook of photography for the iPad—Plastic Prophets of Vinyl Redemption—is finally available in Apple’s iTunes bookstore! Yes, 135 pages of splashy digital color, filled with behind-the-scenes photos, sketches and in-depth analysis of the photos I shot for my first large scale solo exhibit at Distinction Gallery in 2009. I’d place this particular coincidence in the category of “painfully bittersweet,” as I absolutely LOVE to wander the stacks of a sprawling bookstore, and find the mounting closure of neighborhood stores disturbing in a way reserved for fears of the apocalypse. On the other hand, it would have been quite impossible for me to publish (and sell!) the book I’ve just released without the benefit of electronic distribution. 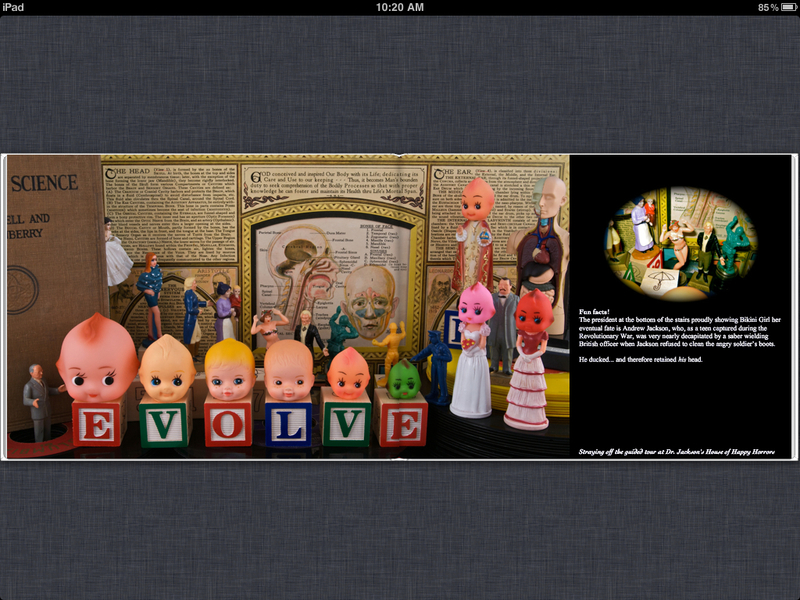 Oh, not that I wouldn’t have liked to produce a lavish coffee table tome… and, I actually did just that! In the weeks leading up to the original exhibit I designed and printed a quite superb 100 page hardcover book that chronicled all the work that had gone into the exhibit. Note to art collectors of the future telepathically browsing eBay in the year 2525 for an original printed copy of Plastic Prophets of Vinyl Redemption… At the cost of $120 each in the year 2009, I printed exactly two copies: one to be on display during the exhibit, and one for the owners of the gallery. So any other copies you might see advertised are likely (gasp!) forgeries. Be forewarned! So why not mass produce the original book and sell it through my web site or local independent bookstores? Uh… as mentioned above, just one copy of the book—full color, full-bleed—cost 120 bones to print. Repeat… cost. That means I’d have to retail the book at around $150 or so, or (to bring the price down to, say, $40) print it in China at sufficient quantities that my otherwise safe and comfortable home would become a warehouse firetrap of unsold inventory. I mean, people like my art and all, but I think it would be difficult to find thousands of people who might be willing to plunk down forty or fifty dollars for a printed copy. On the other hand… I thought there might be quite a lot of people who would quite happily pay a wee bit of cash for a version of the book they could enjoy on their iPad, iPhone or iPod Touch. Just think… hours of artsy browsing pleasure for the price of a heavily sweetened cup of coffee! I took the original 100 page book and expanded it greatly, with tons of additional photos, more insightful prose, and images of the installation I’d constructed in the center of the gallery. The original hardcover had been slapped together in two weeks while I was working full time. As such, sacrifices were made and the bar I’d set for completion was that ol’ standby of the Time Constrained… good enough. This time around, with no deadline gripping at my collar, I spent close to four months on design, layout, and figuring out the hitherto mysterious (and grossly under documented) features and capabilities of Apple’s new illustrated book format. Yes, it’s good to have an engineering degree! Panned all around the screen! And the very best part? No printing costs. No distributor costs. No unsold inventory piling up through the hallways of my home. In fact, apart from the reasonable percentage Apple takes from each sale… no split of the revenues with a billion people. And this means I can sell my beautiful book for whatever price I want. How does $3.99 grab you? Note: The grabbing will be 2.99 euros in France and Germany, and 2.49 pounds in the UK, but still $3.99 in Canada and Australia. Yep, no big profit game here. I just wanted to be able to share my work as widely as possible and provide people a fun, interesting, and engaging way to experience and explore what lies behind each of my photographs. Did I mention there’s a link to the book? I should do that… Check it out in the iBookstore!! Wanna see some screen shots? Of course you do! Plastic Prophets of Vinyl Redemption Book Available NOW!!! 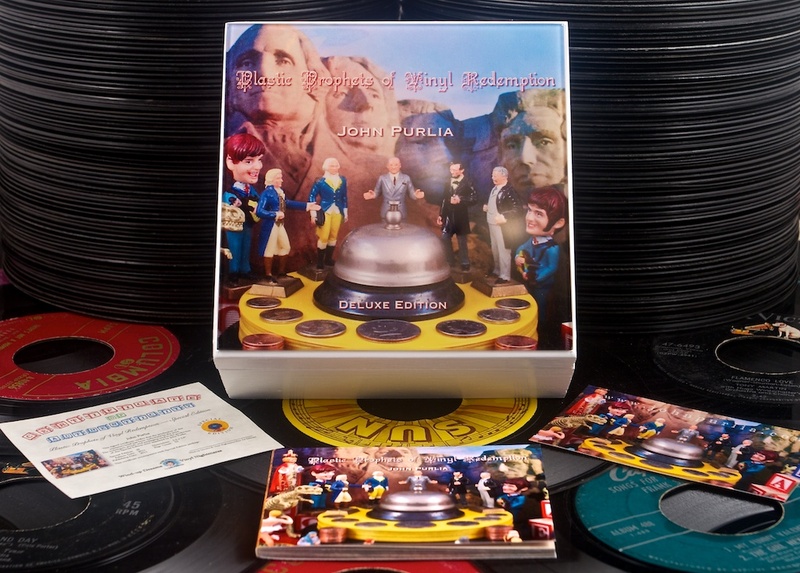 Back in the not-so-distant past of February 2009, John had a solo exhibit at Distinction Gallery in Escondido, CA entitled Plastic Prophets of Vinyl Redemption. This well thought-out series of photographs addressed the themes of power, greed, evolution, and desire–you know, your usual Valentine’s Day fare. Besides the super fun videos John created for our fellow art lovers to watch as an accompaniment to the photos, he also printed a monograph so curious lookie loos could take a peek at behind-the-scenes information and learn how he devises his photographs and sets them up. The book proved to be so popular, we wanted to make it available for viewing by everyone, not just those (awesome) folks who were able to attend the exhibit. As we explained in this post from January 2010, printing the book was a bit pricey, so John, in all his engineer-y genius, created an online version. Fast forward to 2011. A little something called the iPad 2 comes out and along with a billion other people, John becomes enamored with this incredible piece of technology. Hmm…wouldn’t it be great if we went back to the Plastic Prophets book and added more info, photos, and insights we couldn’t include the first time around? So that’s just what we did. After several months of some intense coding on John’s part, and intense editing on my part, we are thrilled to announce that Plastic Prophets of Vinyl Redemption is now available for your delight and pleasure in iTunes. It’s a fascinating read on how an artist brings an image from his mind into reality, and the book is jam-packed with photos so vibrant, you want to lick them. (You have my permission to use that in your book review.) At only $3.99, it’s an incredible bargain. Besides the US, Plastic Prophets is also currently available in Australia, Canada, France, Germany, and the UK. Please head on over to the iTunes store and check it out. We’d love to hear what you think! So far I’m kind of liking this blog thing, which is intended to cover a broad range of topics; not just self-serving boasts about my photography and writing exploits. Well, today is different, since that is exactly what I plan to cover in this post. Yes, that’s right, this post is about me! me! me! I have a bunch of fun projects in the works, and thought I’d share some information about what’s coming in the weeks and months ahead. Anyone who knows me reasonably well knows that my favorite day of the year — better than Christmas, my birthday, and Opening Day of the baseball season all rolled into one — is Record Store Day! As always, I’ll be hitting some of my favorite independent record stores and looking for all the special releases some of my favorite bands have planned for that day. This year, though, is different… I’ll be offering a special Record Store Day deal to all of my Twitter and Facebook followers! I figured, why not? Having relied so heavily on vinyl records for the many years I’ve been taking photos, it only seemed natural to find a way to share all this vinyl goodness. If you’re not already a follower on Twitter or a friend on Facebook, sign-up now, and wait for the special announcement coming on Saturday, April 16. My first solo exhibit was in early 2009 and I spent the better part of the previous year cramming every night and weekend with an incredible amount of work in preparation for the opening. Being one of those people who is always on time or early, I completed everything for the exhibit with several weeks to spare. Good, because I would not suffer the embarrassment of arriving at the opening reception with photos yet to hang, but also bad because I felt as though all my energies had yet to reach their full potential. Clearly, I needed another project. That project was a 100 page book, written, designed and printed in about 3 weeks that was filled with behind-the-scenes images and information about the creation of every photo in the show. I printed two copies of the book and had one on display in the gallery for the run of the exhibit. Why only two copies? Because each handsomely bound hardcover book cost about $120 to print, and while people do seem to truly enjoy my work, I imagine very few would want to mortgage their kids to buy a book of my wild photos and witty prose. 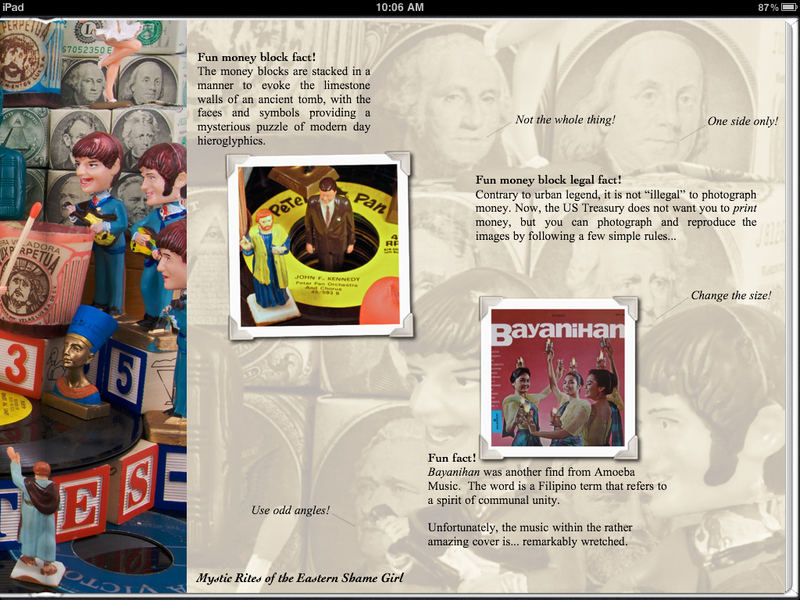 I’m in the homestretch of an effort to redesign and expand the book for the digital age, and should have Plastic Prophets of Vinyl Redemption available for the iPad sometime before the summer. Where the original version was constrained by time and page count (no more than 100 pages through Apple’s print service), the new version adds many, many more photos, a lot more text and “fun facts”, and sketches, and expands areas that I had to cut due to space limitations. It’s going to be a spectacular burst of full-bleed color for your screen and eyes (and you know we all need more full bleed in our eyes). 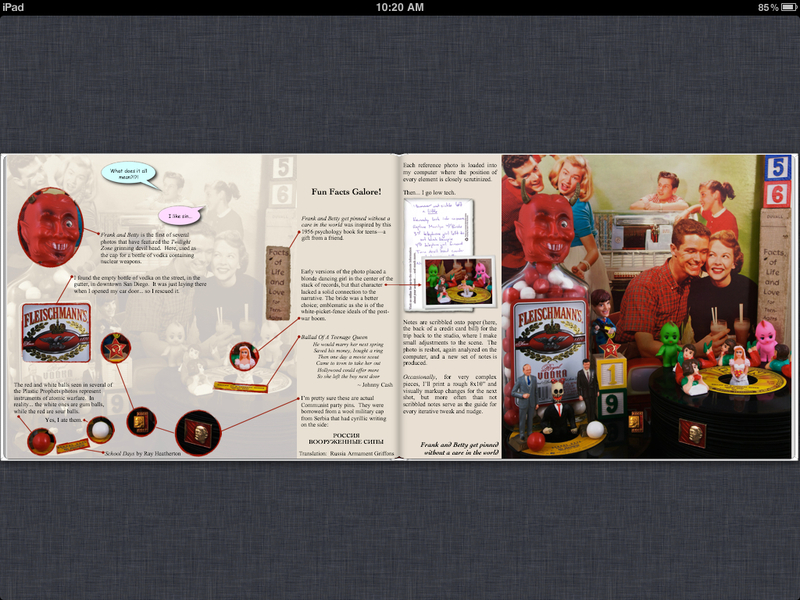 Best of all… I’ll be able to sell the book on the iPad Bookstore for a bargain basement price! Good for me, good for the collective pocketbooks of the world. Though I’ve not yet committed to my next large scale exhibit, I’ve been slowly producing a fresh batch of new photos that are sure to amaze and delight! 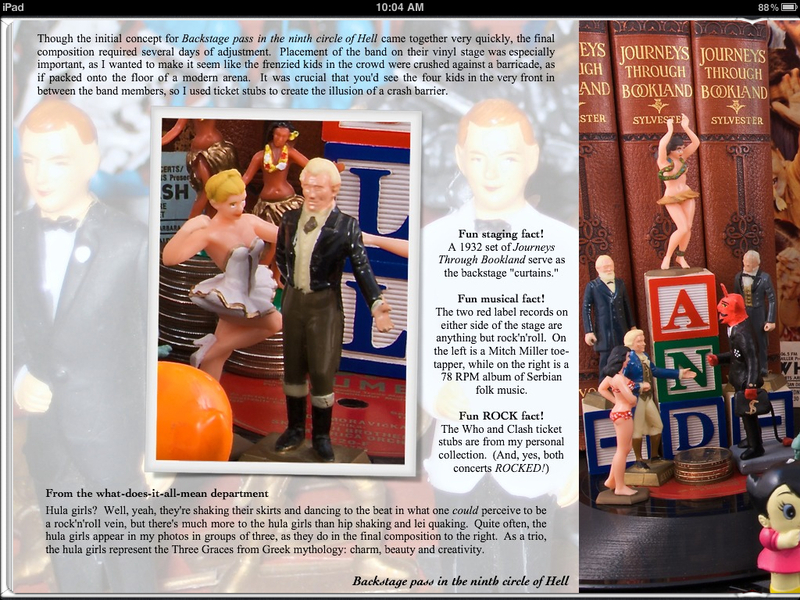 Yes, of course, you’ll continue to see buxom bathing beauties, religious figures and my ever-present kewpie dolls, but be prepared to be introduced to a host of new plastic and vinyl characters wandering about my work in their own playful and devious ways. Four new pieces are now complete with many more on the way. I’ve been invited to participate in a pair of group shows at Distinction Gallery and Artist Studios during the summer of 2011. These will both be themed shows (one, for a very deserving charity), and I’m in the process of preparing early sketches for how my vivid cast of characters will spin and muck with the guidelines. In any case, expect something fun! I’ve submitted my work to a number of art and photography exhibits taking place in San Diego and beyond during the summer months. Open calls are always a crap shoot left to the discerning eyes of the jurors, so when my work gets in I’m grateful; when it doesn’t it, I simply chalk it off as one of those eyes-of-the-beholder things. Way back at the beginning of 2009 while I was wrapping up work on my 2009 exhibit at Distinction, I created a one-of-a-kind monograph for the exhibit. 100-plus pages of behind-the-scenes photos and stories that revealed insight into the process I went through in creating the photographs that were to be part of the show. The book was a lot of fun, and I was very pleased with how it came out and how well it was received by those who visited Plastic Prophets of Vinyl Redemption. People really liked it! Printing the book was EXPEN$IVE! Though I would have liked to make the book available for sale, I really didn’t see a strong market for a book of photos that cost in excess of $120. So, there were only two copies printed. Still, I like to share, and I’ve just completed work on a web browsable version of the entire book. 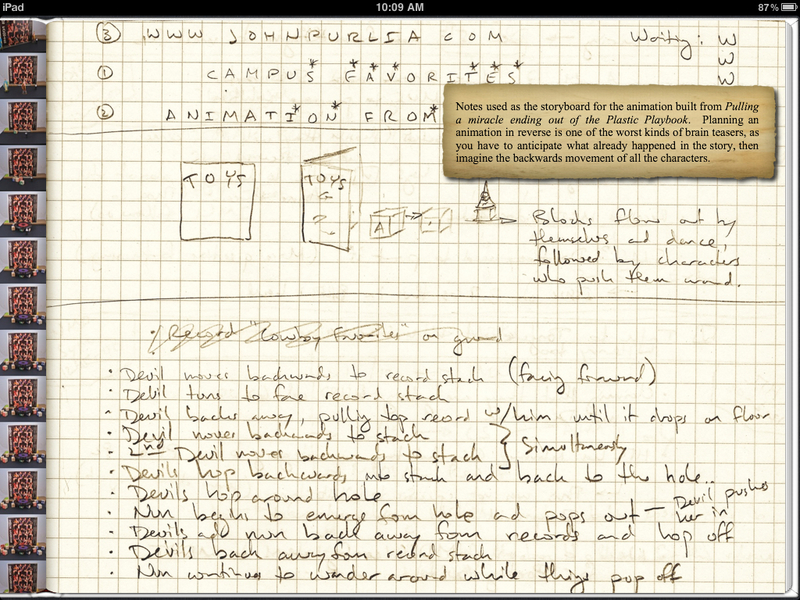 It’s not real fancy, but you can flip through all the pages and read all the text. 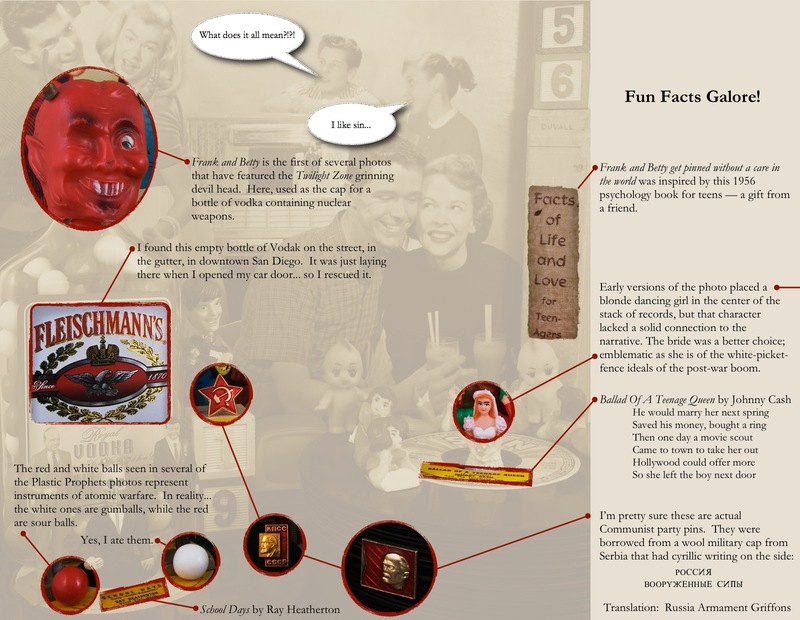 Fun facts! Alternate shots! Weird interpretations of what all this crazy stuff means! I’ve placed a permanent link to the book on the Publications page, or you can simple click on the cover above to open the book and start your exploration through Plastic Prophets of Vinyl Redemption. And… maybe someday, I’ll find an affordable way to produce the book for real so that you can have a spectacular, colorful copy in your hot little hands. Since I don’t have anything especially newsworthy to share (Hey! I have a book coming out! Hey! I have a new exhibit opening! Hey! I’m going to be appearing on Saturday Night Live!) I thought I’d bring folks up to date on some soon-to-be newsworthy items that should become reality over the next few months. Coming up in December is Premier Art Collection: Volume One, the first book collection featuring the magnificent art of Ray Caesar. The book is being published by Murphy Design (so you know it will be eye poppingly beautiful), and will include an essay I wrote for the project over the summer. This was a fun project and I was given a pretty loose rope in writing my piece. The result is something that I hope compliments the wonderful speculation and deep emotional connections Ray brings to his work. 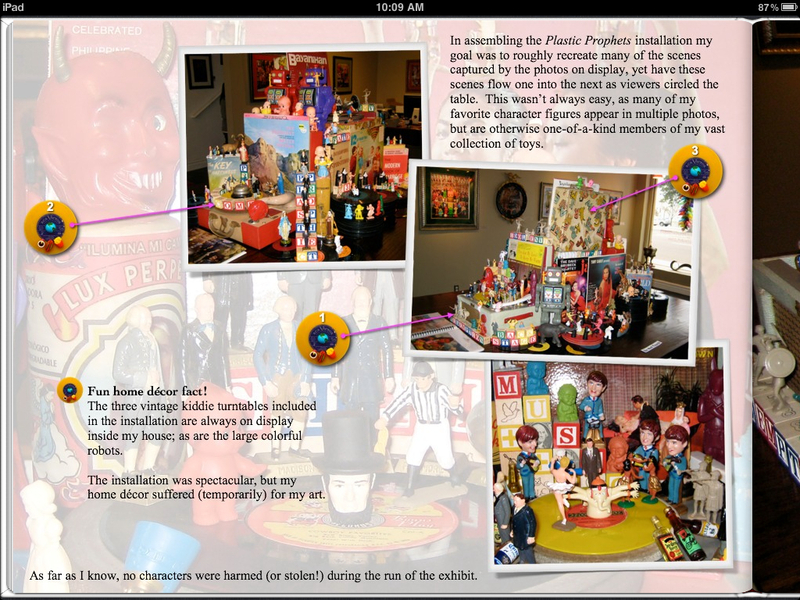 One part biographical essay, one part psychedelic fiction, one part table setter for a book full of magnificent artwork. Hope you all enjoy it, and do stop by the Murphy website and reserve yourself a copy. Earlier this month I spent some time with Kia Momtazi, one of the fine arts writers over at San Diego Citybeat, who will be writing a feature article about my photography for an upcoming issue. 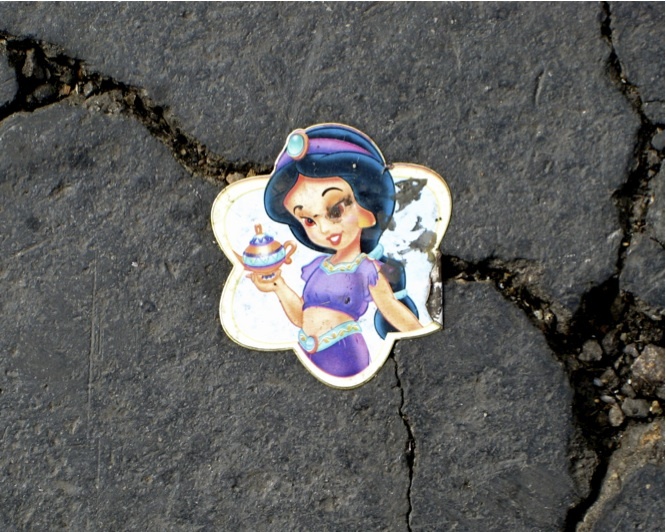 We met over two Saturdays, first at my place, then the next weekend at the San Diego swap meet where we searched for vinyl LPs and toys (the photo above was snapped on the arena asphalt). All along the way we talked art, photography and all things creative and fun. The article should hit the news stands sometime in January,so watch for it on the street (and here on my site, of course). Hope I make for an interesting and somewhat humble subject! I’ll have a four page spread in the upcoming Collectors issue of Focus Magazine, officially the February 2008 issue, which probably means a street date of sometime in December or January. Focus is rapidly becoming one of the premier periodicals for fine art photography, and I was very honored to have my gallery submission accepted for publication. Four of my very best photos will be reproduced in the magazine, in addition to a brief biography that attempts to explain how it is that my photography is considered fine art (i.e. conceptualization, technique, blah, blah, blah). My work is somewhat of a departure for Focus, which I think is a good thing. I’ve seen a preview of the upcoming issue (which features some great interviews and amazing photography throughout) and am very proud to be included alongside some truly gifted artists. Focus is published out of New York and distributed to galleries and collectors across the country, so this will definitely be the broadest exposure for my photography yet! Keep your fingers crossed that my slightly demented photographs capture the the eye of an exuberant collector or the imagination of a discerning gallery — of course, with a taste for toys, records and robots! Focus is printed using the highest quality paper and printing imaginable; definitely worth the cover price! Watch for it on your favorite magazine stand in the next month or so. That’s it for this short update… more soon, I hope! Oh John! Your wondrous photography has made me a better lover! Nuns as bowling pins?!?! Hula girls shaking their hips at seminary students?!?! Dinosaurs witnessing the birth of a nativity tiki god on a beach in Hawaii??!?! John! You are surely going to Hell!! Comments are your way to join the community spirit of the web and engage in discussion about the items I post. Good, bad, indifferent. Thanks, praise, criticism. Post your own insights, ask questions or make fun of my socks. And if I don’t like what you add… I can always delete it. My site doesn’t get a tremendous number of comments; just a smattering, really. But I like and appreciate everything that people have in the past contributed, and therein lies the purpose of this particular blog entry… My precious comments are gone! Vanished! Disappeared like fleas from a dog on a bonfire! (There’s something you can comments on… and I like dogs!) I’m not sure what happened, exactly, but suffice it to say “I did something” and the technology that commands my site decided that what I did was bad and heinous, and decided to punish me by zapping every one of the comments I’d collected in the year or so that I enabled reader comments. Anyway, for the moment, the cruel winds of time have covered the footprints of past comments in this sandy oasis of culture and creativity. The slate has been wiped clean and begs for the creative, thoughtful prose of readers around the world! Express your inner critic. Toss in a comment about my photos, my book, art, music or your favorite toys. Lots of past posts to choose from throughout my little web world, and all you have to do is… click. Thanks for playing….